My Owl Barn's third annual owl calendar is ready! Customize a calendar with illustrations from artists around the globe, including Ellen Giggenbach, above. Choose from over 40 images, assigning one to each month. Then download the high res PDF and print. The images would make nice gift tags, too, if printed at small sizes. Make a calendar here. This is sooooo beautiful!!!! Thank you sooooo much!!! Thanks so much! I love it! What a great calendar idea! such a wonderful idea!! Thanks! 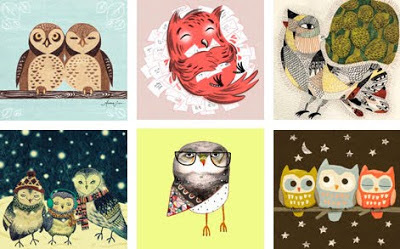 I love owls!!! Lovely! Thanks so much! F.
Thank you so much for letting us know! beautiful! Thank you so much! I just printed out a copy! I'm still enjoying the last year's and I was hoping you'd make it again and voila! Here it is. Thank you so much! I wait for this calendar every year! Thanks! Been doing this since you first posted the link. Thank you! I've beens searching for a beautiful calendar everywhere and this is PERFECT! Thank you for sharing it with us. thankyou-I love all the art work-was hard to choose. I plan to put some together for Christmas gifts. I was so sad to see my 2012 Owl Calendar come to an end, but I was so happy when I checked online and found the new 2013 version! Thanks so much!!!! aw, is this no longer available? i can't get the download to work. Hmm, the calendar page isn't loading for me either today. I gave up waiting. You could see if there's a contact email over there and send a request if you like! So adorable and cute! I love owls! Owls are so cute, beautiful and lovely. Thanks for being able to download that lovely calendar, the owls are so sweet.Hope you are doing a 2014 one.